'White Flash And Cold Water' After Bridge Collapse In Wash. : The Two-Way After a truck carrying a heavy load struck the side of a bridge that carries Interstate 5 over the Skagit River north of Seattle, the roadway collapsed. No one was killed. Dan Sligh and his wife were in a pickup. "You just hold on as tight as you can," he says of the fall they took. 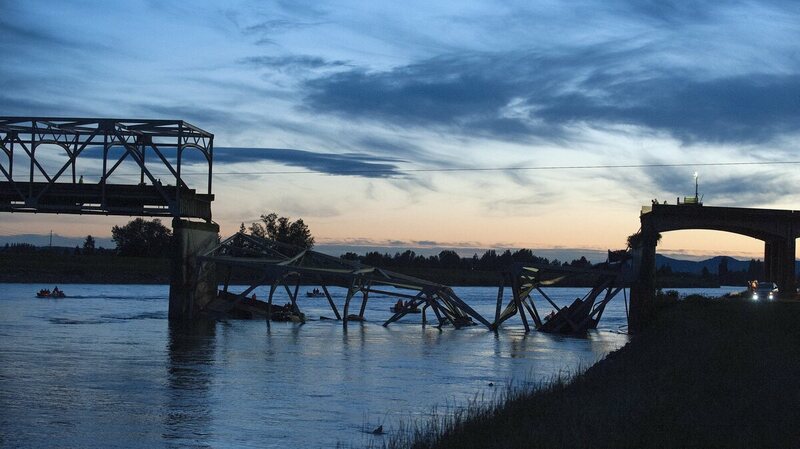 The scene near Mount Vernon, Wash., on Thursday after part of an Interstate 5 bridge collapsed into the Skagit River. Sligh tells The Seattle Times that they were driving on Interstate 5 near Mount Vernon, Wash., around 7 p.m. local time when he saw a truck carrying a heavy load strike the southbound side of a bridge over the Skagit River. Moments later, a long chunk of the bridge collapsed into the river. "Forward momentum just carried us right over and ... we saw the water approaching," Sligh told the Times. "You just hold on as tight as you can. Then just a white flash and cold water." Judging from photos taken at the scene, they fell at least a couple stories. The Slighs were in a pickup. As we reported earlier Friday, authorities say no one was killed. At least two vehicles went into the river. Three people, including the Slighs, were rescued from the water and are said to be in stable condition at area hospitals. NPR's Martin Kaste tells our Newscast Desk that the bridge's collapse will have a major impact on traffic in the area. "This is the principal artery between Vancouver, Canada and Seattle," he says. The Washington State Department of Transportation says Interstate 5 is closed between exits 227 and 230. There's a map showing an alternate route through the area posted here. "The bridge is classified as a 'fracture critical' bridge by the National Bridge Inventory. "That means one major structural [failure] can ruin the entire bridge, as compared with a bridge that has redundant features that allow one member to fail without destroying the entire structure." That inventory also lists the bridge's type of construction as "functionally obsolete," which KING-TV in Seattle says means "the design is outdated, such as having narrow shoulders." The newspaper adds that "the bridge is used by an average of about 70,000 vehicles per day, 12 percent of which are trucks." Updated at 5:35 p.m. ET. Officials Blame Semi-Trailer For Collapse. Washington State Patrol spokesman says the "sequence of events" that led to the bridge collapse was set in motion by a semi-trailer with an oversized load hitting a support beam. "It's very obvious to us that the one thing that initiated that whole sequence of events was when the load the truck was carrying struck the support girder," Sergeant Kirk Rudeen said. Update at 10:50 a.m. ET. VIDEO Of Sligh Talking About What Happened. According to the Times, "officials said the highway will not be fixed for weeks at the very least."